From the Potomac: WHAT Supreme Court decision? We’re wondering what to make of those Pew Research Center findings about the public’s awareness of the Supreme Court’s healthcare ruling. On its face, it’s very troubling. The decision on the healthcare law was one of the most widely anticipated and publicized events of the year. The media were building up to it for months, describing it as possibly the biggest factor in a very close presidential contest. And when it was handed down last Thursday, there was nonstop coverage – on radio, TV, cable, wire services, internet alerts, blogs, tweets, you name it. The next day it received huge coverage in newspapers throughout the country. (Check out the Newseum site of Page 1’s to see the headlines around the country.) It was clearly one of the most ballyhooed events in years. So how could it be that nearly half of the public misunderstood it, or didn’t even know it happened? That’s what Pew found. 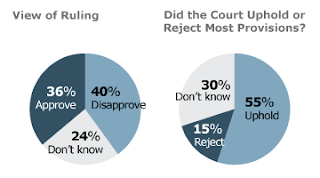 Specifically, 30 percent of the public said they did not know what the court did, and 15 percent had it backwards – they believed that the court overturned the law. So a total of 45 percent did not know, or had it wrong. Is the American public really that oblivious to – or disinterested in – the most important events of our time? Let’s hope not. And two factors give us a little encouragement. First, of course, two major cable news networks had it backwards, at least briefly. Both CNN and Fox News jumped the gun and reported that the court had rejected the individual mandate, before they read the full decision. And those breaking reports raced through cyberspace, at least for several minutes. It would have been easy to be confused. And second, it turns out that Pew began its polling on June 28, the very day of the decision. Even though the polling continued for four days (over a weekend, basically), a sizable number of the respondents may have been reached that first day – when there was confusion, and when many people who aren’t tied to their cellphones 24/7 had not yet turned on the TV or computer, or picked up the next morning’s newspaper. In any event, this case shows how hard it is to reach the mass audience in a time when everyone can pick and choose the subjects they want to follow, and when they have so many distractions beyond breaking news. Still, let’s hope that a survey a couple of days later would have had different results: a better informed public.